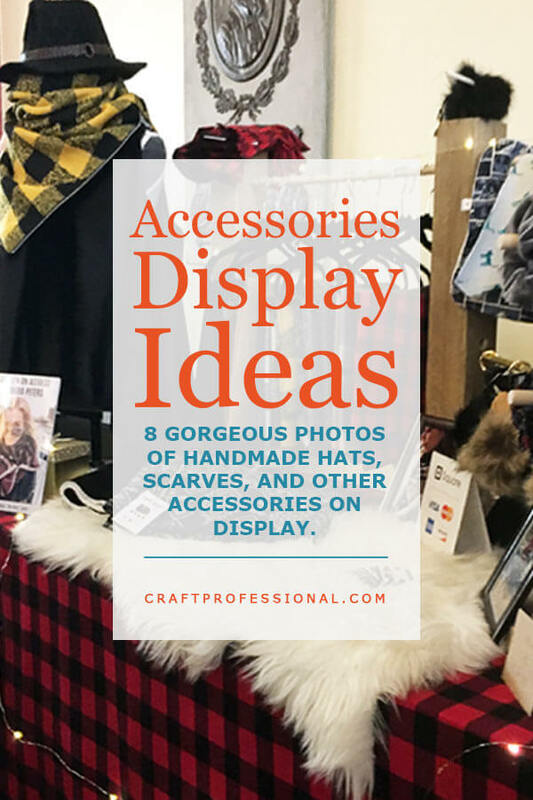 Let's take a look at 8 wonderful accessories booth display photos for those who sell hats, scarves, and smaller items of clothing. If the items you sell are fairly small, the display solutions used in these booths may work for you. Mannequins or dress maker's forms aren't just for clothing booths! They can be used at an outside corner of your booth to create a focal point that draws attention to one (or more) of your most impactful items. Full-sized mannequins can be used effectively to display jewelry, scarves, and other accessories. The dress form featured in this jewelry booth, situated at a front corner of the 10x10 space, can be seen from a distance, so it helps to draw people into the booth. 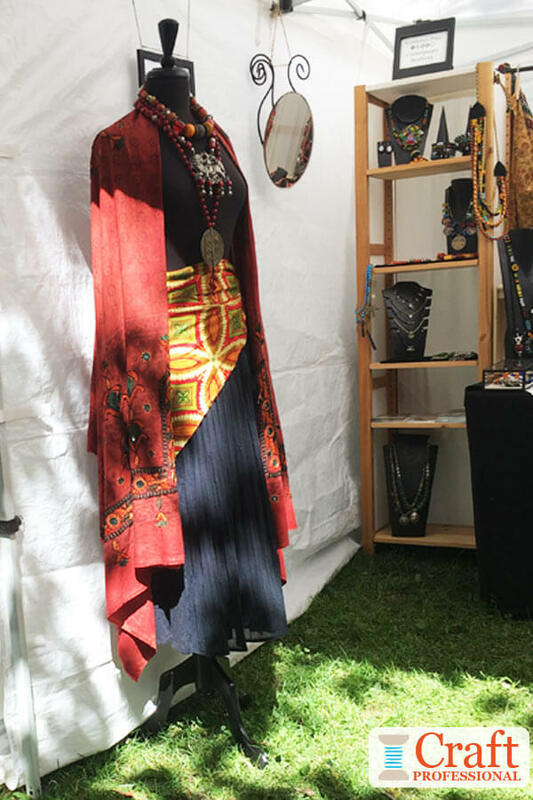 It is dressed in simple clothing that works with this designer's target customer's style and adorned with some of the most eye-catching pieces from the jewelry collection to grab the attention of people strolling by the booth. The next three photos feature different angles of the same hat booth. The foundation of the display is made from gridwalls in combination with hat holders designed to be used with a gridwall system. It's a simple, portable solution for displaying hats. Notice how the sidewalls on the tent improve the look of the display, blocking the view from beyond the tent and keeping customers' attention focused inside the booth. In addition to the gridwalls, a couple of tall hat stands add to the display and make good use of the space at the front corner of the booth. The old, rustic style of the hat stands are a perfect fit for this display. Do try to ensure the feel of your display furniture is a good fit with the overall style of your product. 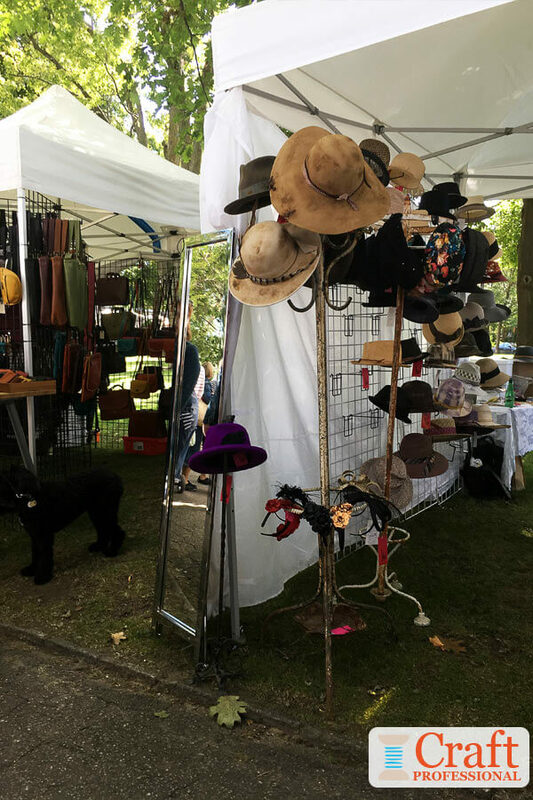 Notice the mirror at the outer edge of the booth that's perfectly placed to encourage shoppers to have a little fun and try on these dramatic handmade hats. 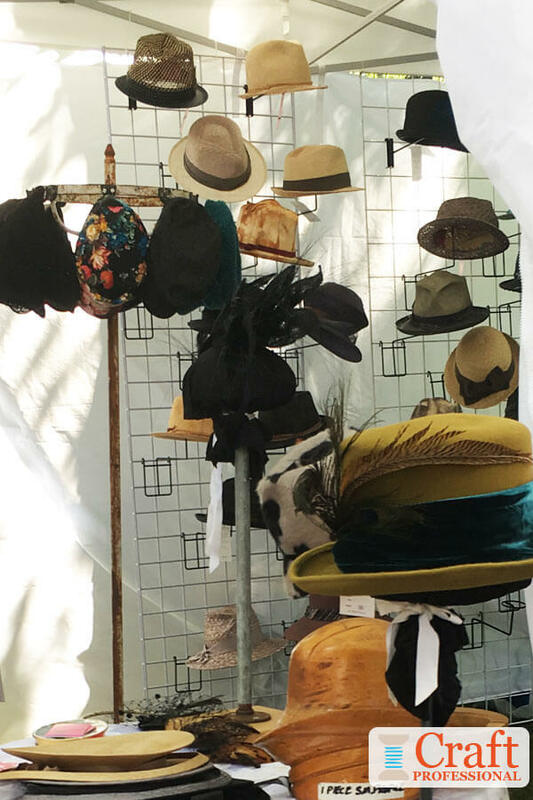 In the final photo of this fabulous hat booth, you'll see a spectacular green and peacock blue hat featured at the front right of the booth. This hat is one of the designer's most eye-catching items. Featuring it at the front of the booth is an effective way to draw people in. 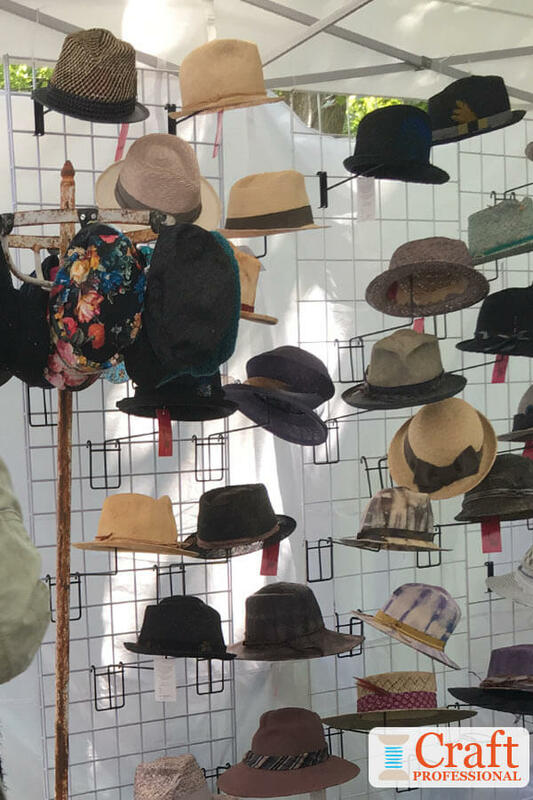 Even if passing shoppers don't believe they can pull off such a dazzling hat, their eyes will be drawn to it, and they'll be tempted to explore the booth to look for more treasures! 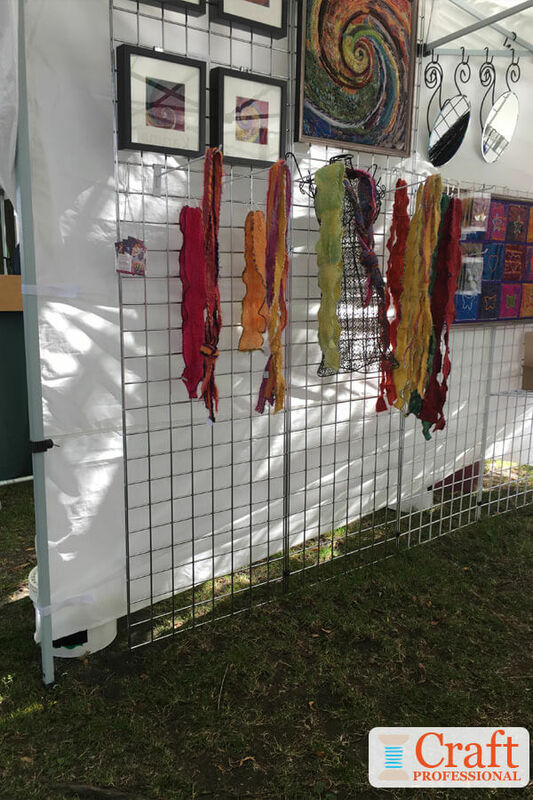 This craft booth features both accessories and art on display. 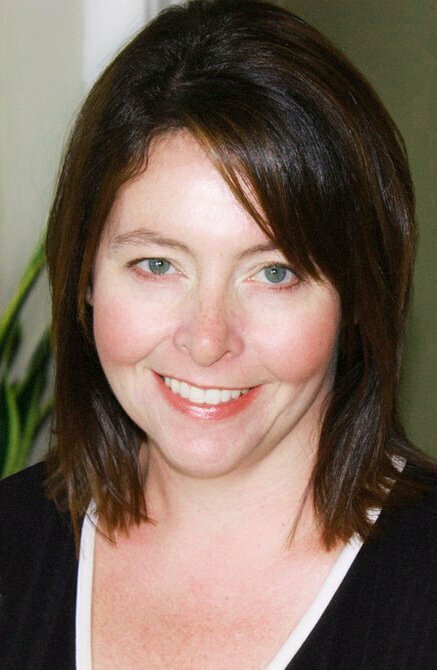 At some point, you may branch out to offer items that fit into other product categories, and that diversification can make displaying your work tricky. In this case, the gridwalls work for displaying both the art and the gorgeous scarves. Gridwall displays truly are a versatile option for showing a variety of types of crafts. Notice how beautifully the colors in the scarfs reflect the colors in the art. Although there are two very different products displayed in this booth, it works as a whole because they are connected with color and style. The next two photos below show two sides of the same booth. 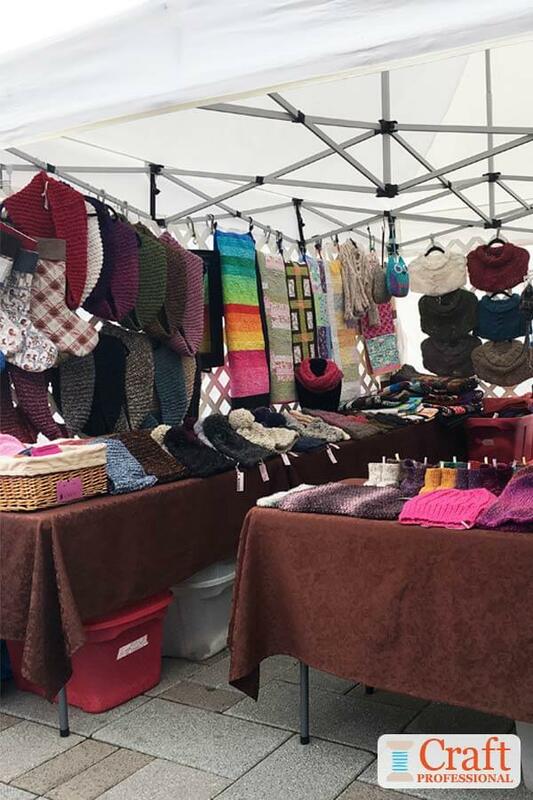 It's an unpretentious display of knit accessories at a busy outdoor farmer's market. This display would be quite inexpensive to put together. Items are simply hung on clothes hangers from the frame of the tent. If you look closely in the spaces between some of the items, you'll see lattice on each side of the tent used to provide extra rows to hang products. The lattice is painted white, so it completely fades into the backdrop of the sidewalls. It's an inexpensive display option that you can pick up at any building supply shop. Do be a bit careful with lattice in a craft display. It can convey a very casual feel that fits with some products and shows but not others. 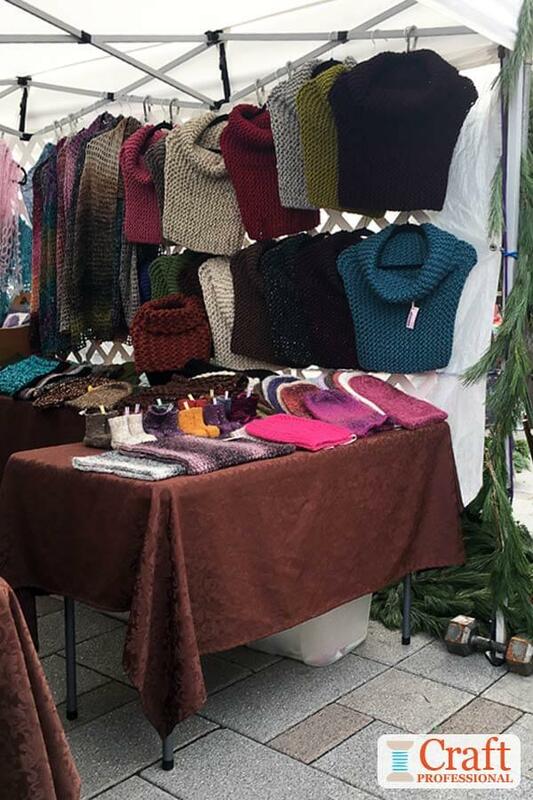 In the case of the booth below, the products are casual, they are displayed at an informal farmers market, and the lattice is almost completely covered anyway, so it doesn't impact the overall look of the booth. Here's an accessories booth display that reflects trends of the moment. 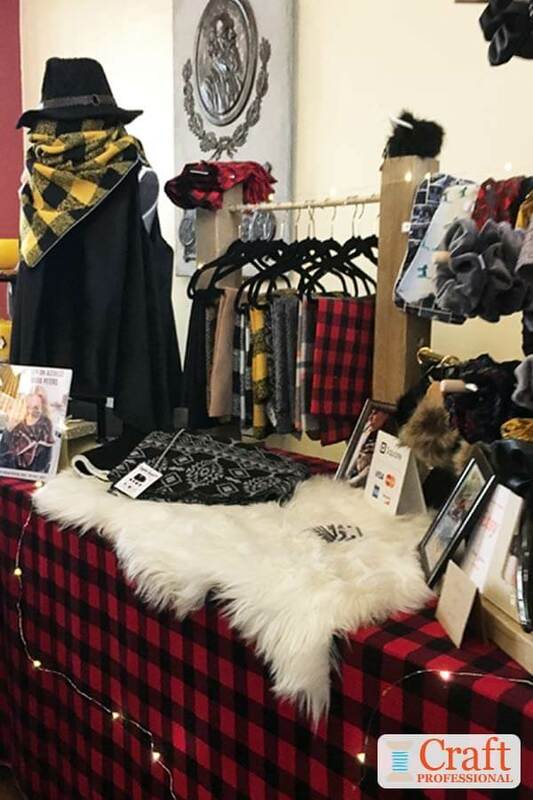 The red and black buffalo check table cloth, faux fur rug, and tiny fairy lights are all reflective of decor trends that were popular at the time this photo was taken. They are a perfect fit for the accessories on display. If you're going to incorporate a trend or two into your display, be careful to choose inexpensive items that can easily be changed out once the trend passes. Be wary of building your entire booth, or a substantial element of you booth, around a trend. Keep the foundation and more expensive display furniture timeless, and throw in a trend or two using inexpensive items that can be changed out easily. 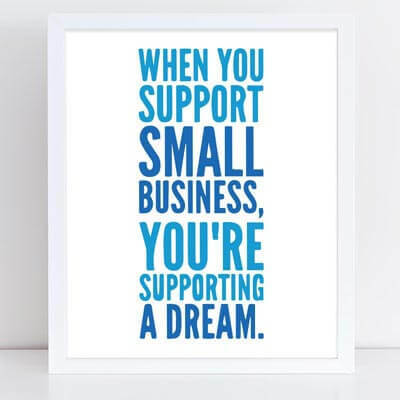 Encourage your customers to splurge a little and support small and handmade businesses with these printable booth signs in my Etsy shop. 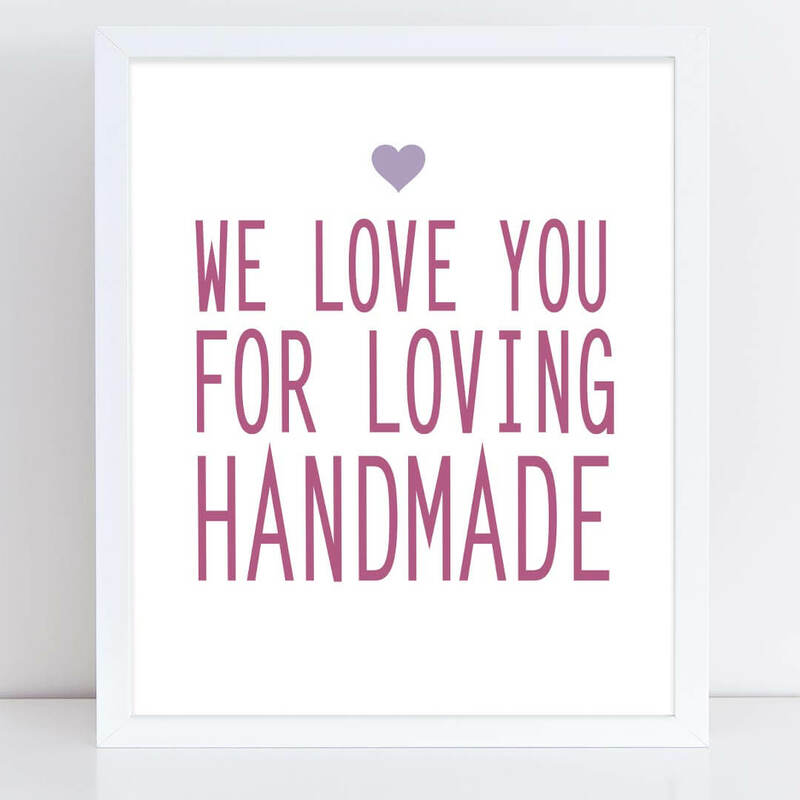 We love you for loving handmade. 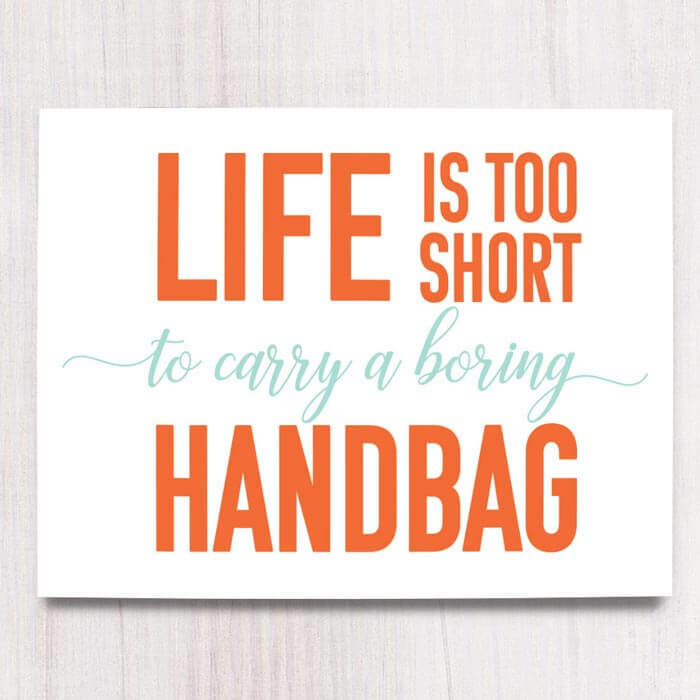 Life is too short to carry a boring handbag!